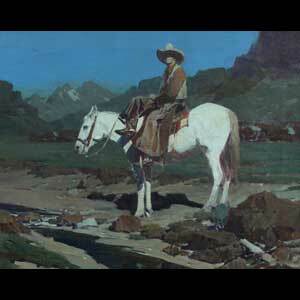 Frank Tenney Johnson, ANA (CA, 1874-1939), "Valley of the Moon" 1937, oil on canvas, signed LL and d.1937. Titled, signed & d. in pencil verso, 16 x 20. 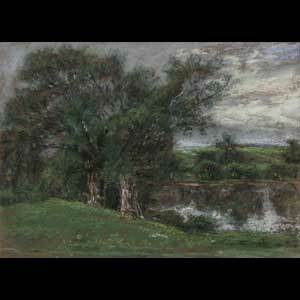 This is the first time this painting has been offered for sale. 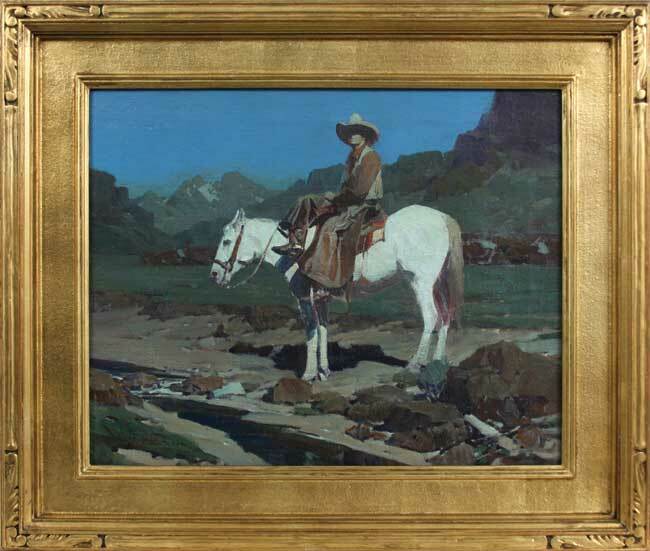 Dr. Heisel commissioned the painting in 1937 and it has been in the family since completion. 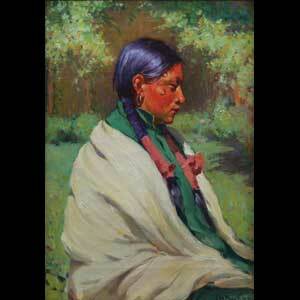 The painting sells with a letter from the artist dated January 11, 1937. 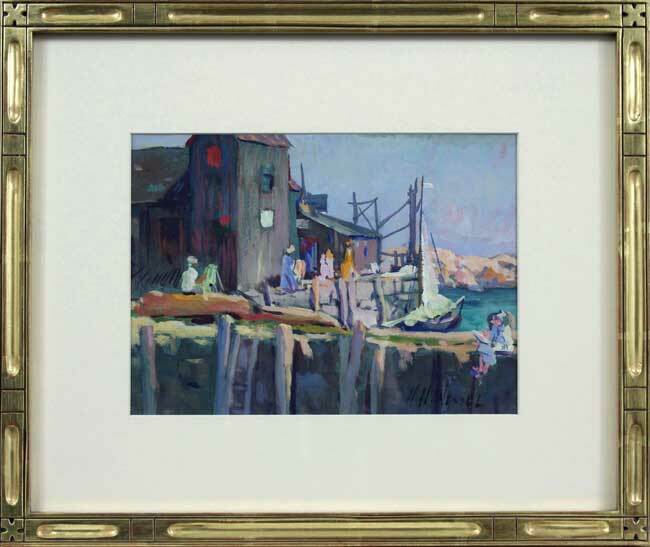 John Ellsworth Weis (OH, 1892-1962), "Happy Harbor" 1928, oil on canvas, colorful Rockport harbor scene, signed LR and d. '28, 20 x 24. 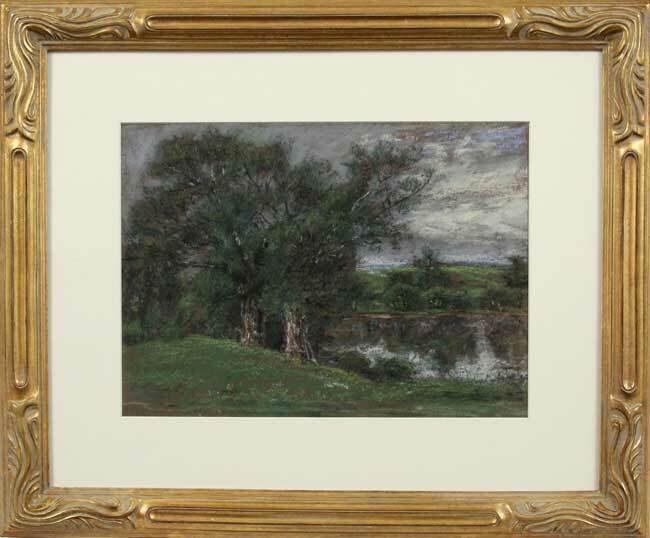 This painting sells with a letter from Frederic H. Kock, President of the Cincinnati Art Club, dated August 20, 1956. 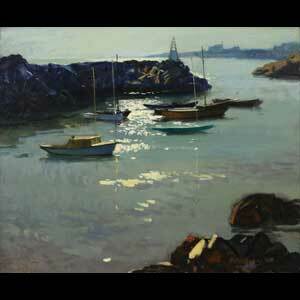 Herman Wessel (OH, 1878-1969), oil on board, striking Rockport scene at twilight, signed LR, pencil signed verso, 20 x 24. 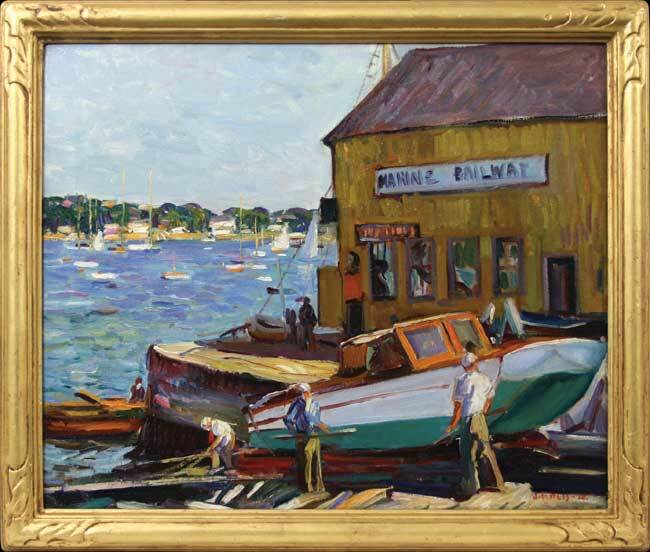 Merton Widdicombe Willmore, (MA, OH, 1893-1974), "Shower's End - Boothbay Harbor, Maine" oil on canvas, signed LL, titled in pencil verso, 14 x 20. 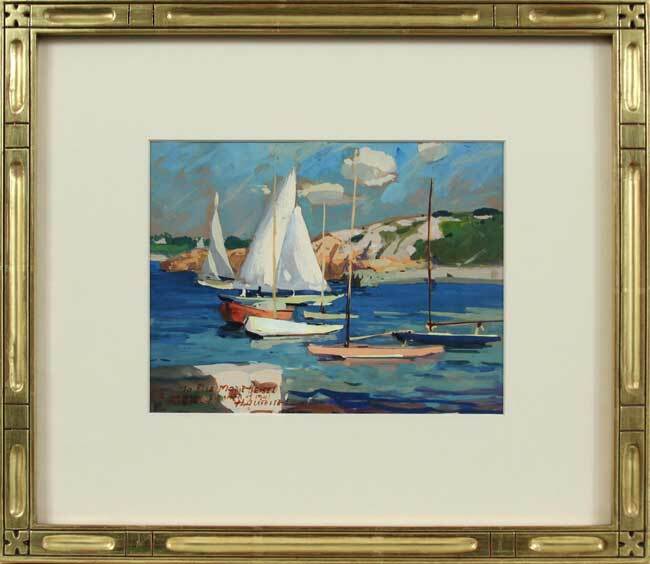 Herman Wessel (OH, 1878-1969), gouache on paper, colorful Rockport scene with sailing ships in harbor, reads: "To Elsa Marie Heisel, Happy Rockport Summer 1941", signed LL, 7 x 9. 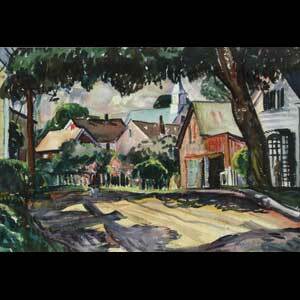 John Ellsworth Weis (OH, 1892-1962), watercolor, Rockport town scene, signed LR, 13 x 19. 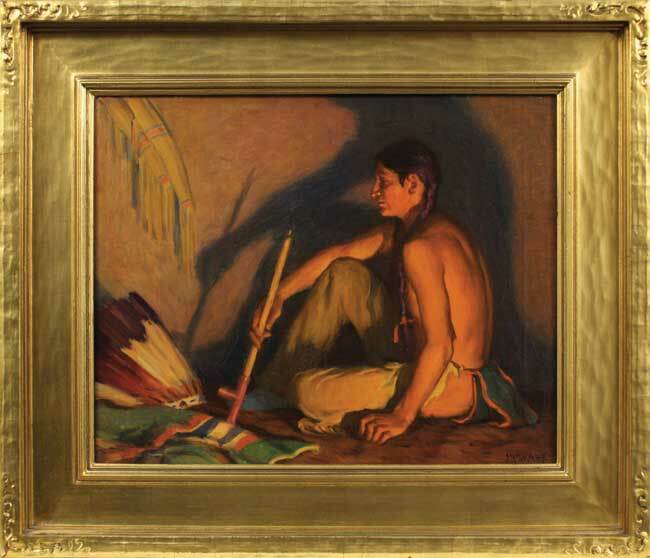 Joseph H. Sharp (NM, CA, 1859-1953), "Campfire," oil on canvas, interior scene lit by campfire with Native American chief with pipe, full headdress and blanket, signed LR, 16 x 20. 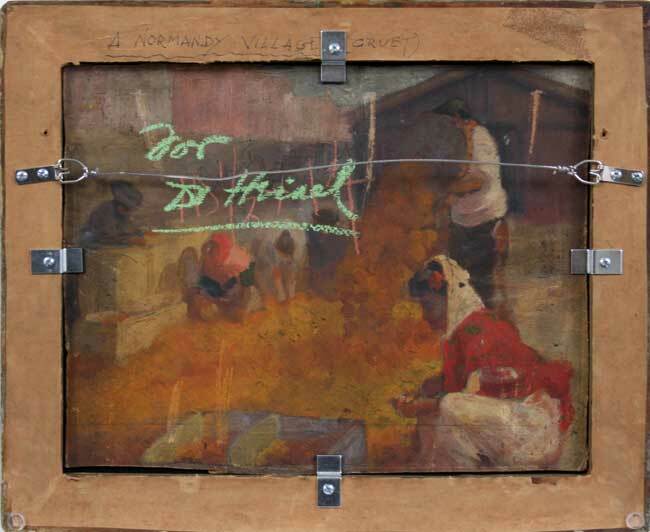 Jacob E. Kunz, "A Normandy Village - Orvet" oil on board, bold impressionist village scene, initialed LL, Verso: titled in pencil, verso reveals unfinished second painting, interior scene with people, reads "For Dr. Heisel" in chalk, 10 x 13. 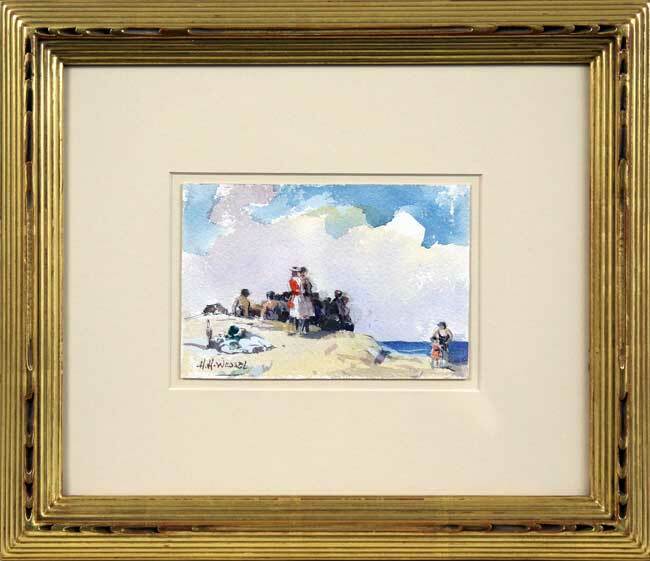 Herman Wessel (OH, 1878-1969), watercolor, beach scene with people, signed LL, 4 x 6. 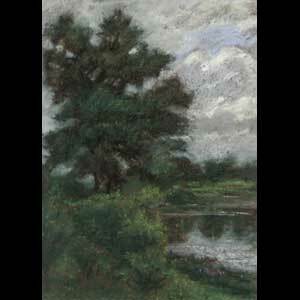 Charles S. Kaelin (OH, MA, 1858-1929), pastel, landscape with two trees and pond, signed LL, 10 x 14. 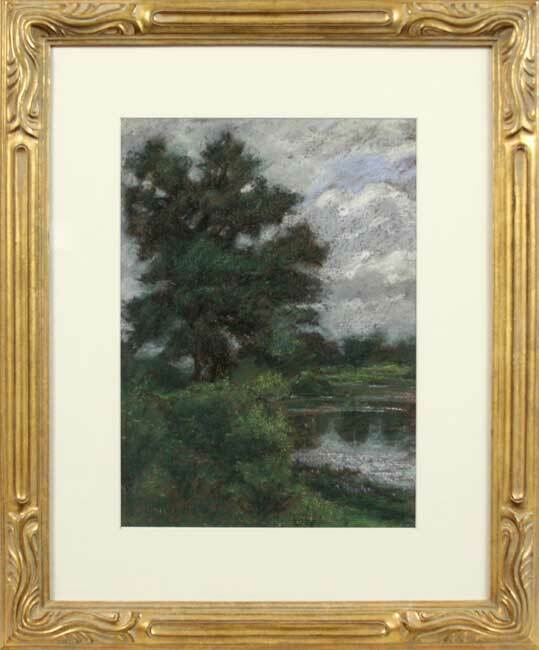 Charles S. Kaelin, pastel, landscape with large tree, possible signature LR, 15 x 11. 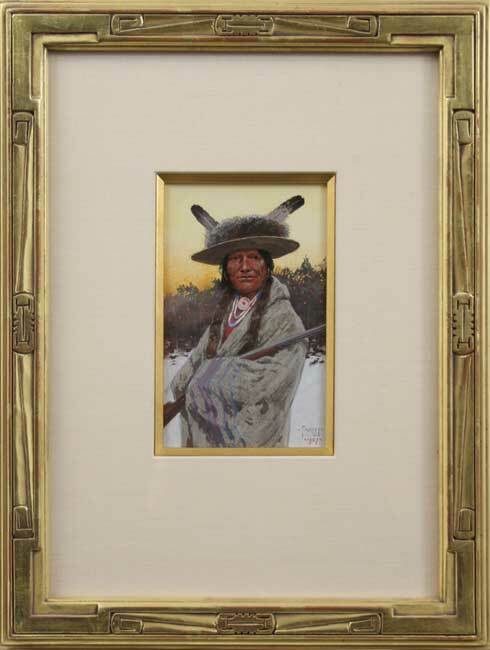 Henry F. Farny, gouache on paper, portrait of Native American chief with feathered hat, braids and gun, signed LR and d. 1907, also signed with Farny's Sioux cipher of circle enclosing a dot, 7.5 x 4.5. 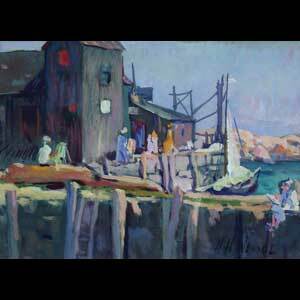 Herman Wessel (OH, 1878-1969), gouache on paper, colorful Rockport scene, signed LR, 8 x 11. 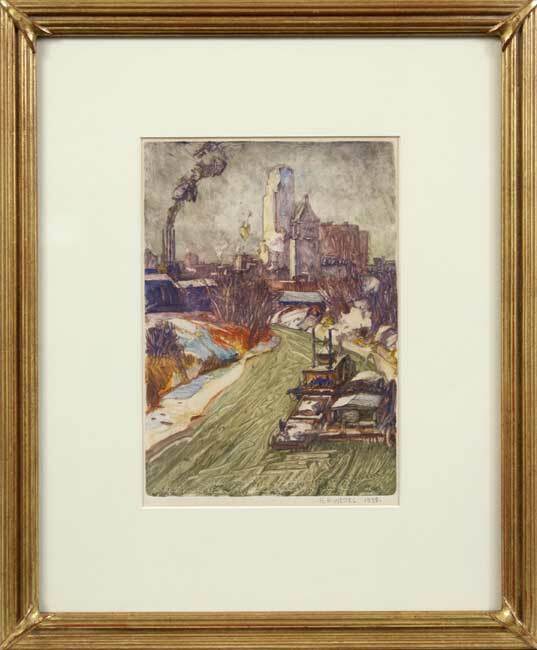 Herman Wessel (OH, 1878-1969), monotype, WPA-style Licking River scene with Cincinnati skyline, signed in pencil LR and d. 1938, bottom of image contains backwards writing, 10 x 7. 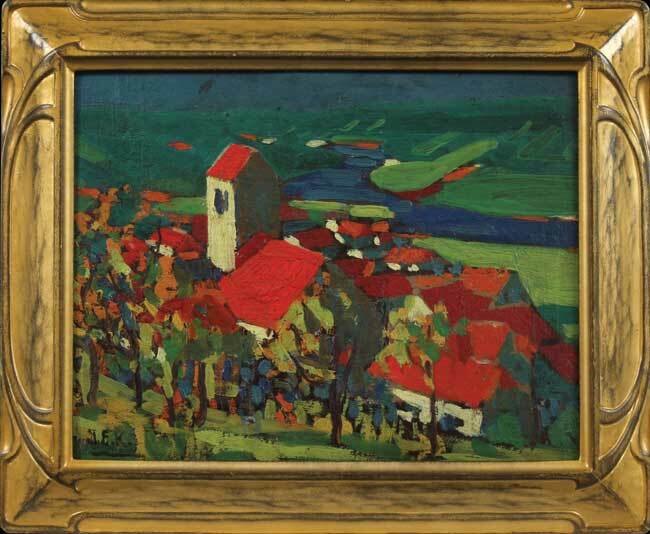 This painting sells with two newspaper clippings referencing Wessel's creation of this monotype. 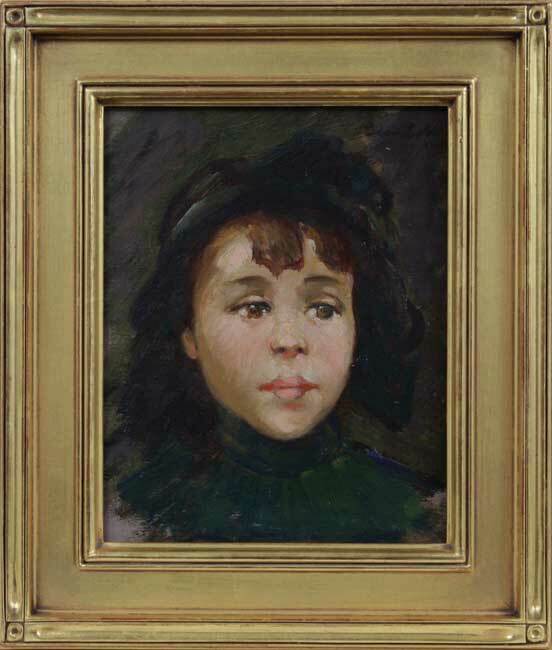 Edward H. Potthast (OH, NY, 1857-1927), oil on canvas, Girl in bonnet, signed LL, signed paper label verso: Edward H. Potthast, 222 W. 59th St. New York City, 12 x 10. 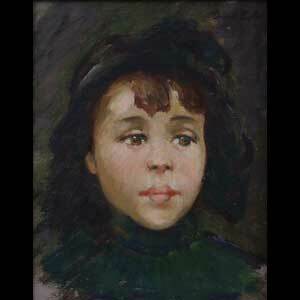 Dixie Selden, oil on board, portrait of young girl with hat, signed upper right and d. '92, 9 x 7. 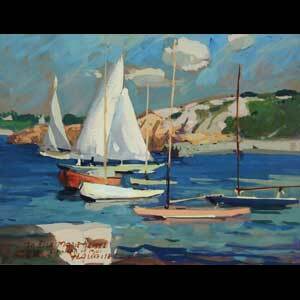 Herman Wessel (OH,1878-1969), "The Herbert and Baldwin - Boats At Rockport Harbor", oil on board, colorful harbor scene with boats and people, signed LR and d. '37, 20 x 26. 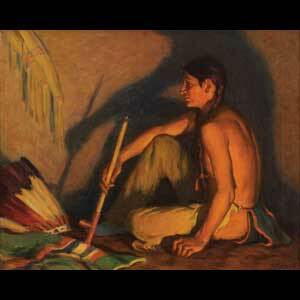 Sells with related Herman Wessel pencil sketch, 9 x 11. 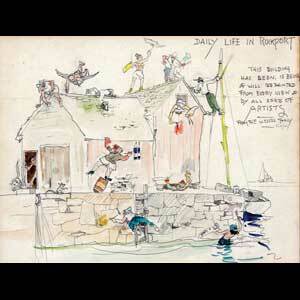 The sketch shows Wessel from behind, standing atop a sail boat painting a Rockport scene. 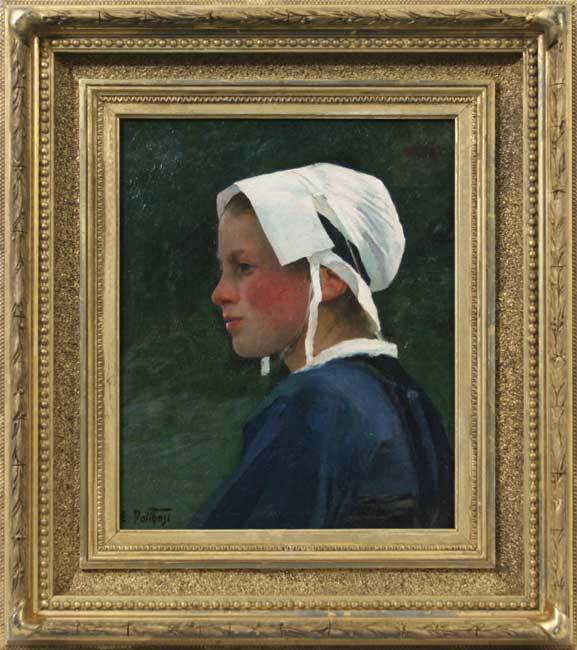 The painting shows Wessel, from the front doing same. 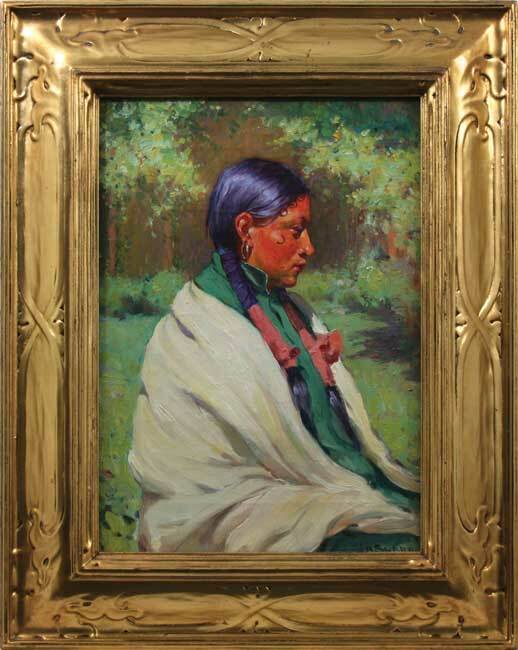 Joseph Henry Sharp, (NM, CA, 1859-1953), "Big Eagle, Taos", o/c, Native American chief, seated and wrapped in white blanket, signed LR. 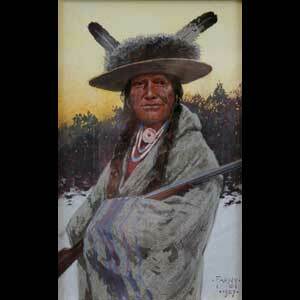 Verso: paper label signed in pencil reads "Big Eagle, Taos", canvas reads "Big Eagle, Taos", 14 x 10. 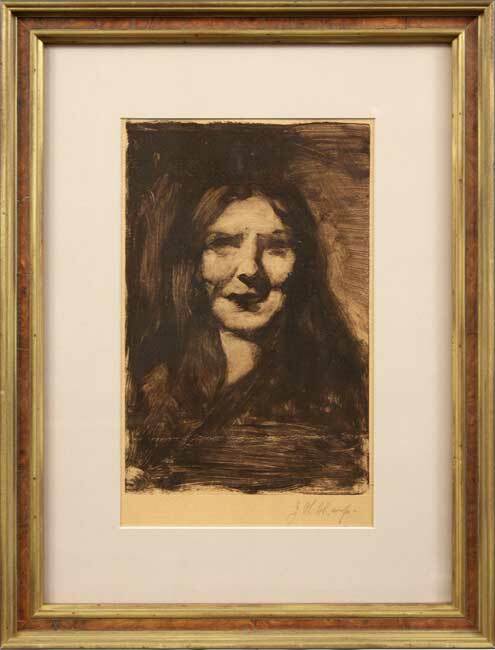 Joseph H. Sharp (NM, CA, 1859-1953), monotype, portrait of woman, pencil signed LR, 12 x 8. 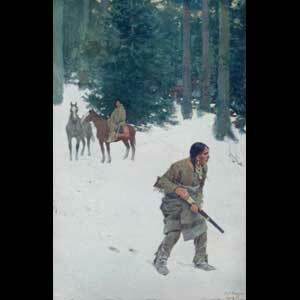 Henry F. Farny (OH, CA, 1847-1916), print, Native American scouts in snow, signed and d. 1909 in print, 9 x 6. 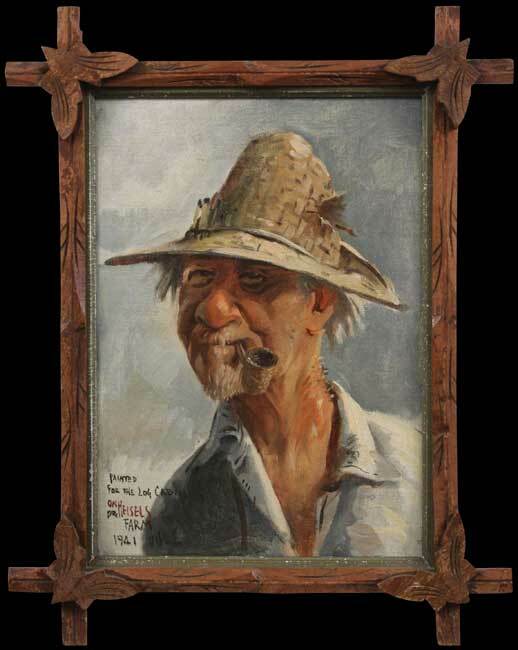 Herman Wessel (OH, 1878-1969), oil on board, self portrait, whimsical portrait of the artist with straw hat and pipe, front reads "Painted For The Log Cabin on Dr Heisel's Farm 1941," 15 x 11. 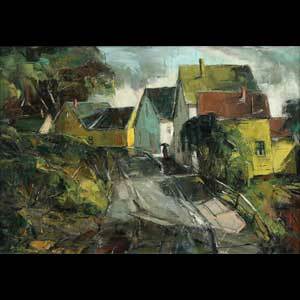 Herman and Bessie Wessel were close friends with the Heisel family. 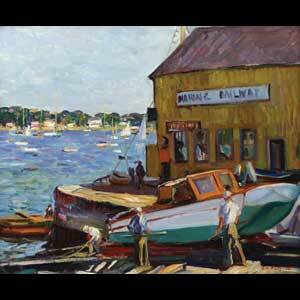 They traveled extensively and spent much time together on the North Shore of Massachusetts. 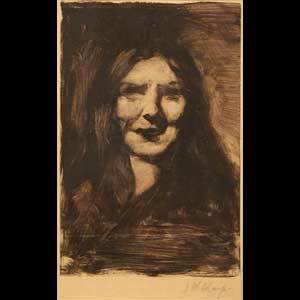 This delightful group of sketches gives us a wonderful glimpse into the lives of the artists and the Heisel family. 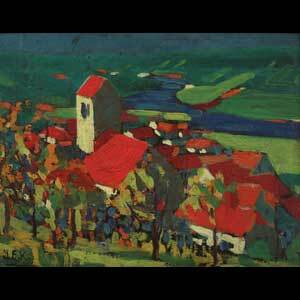 Herman Wessel, pencil sketch with watercolor. 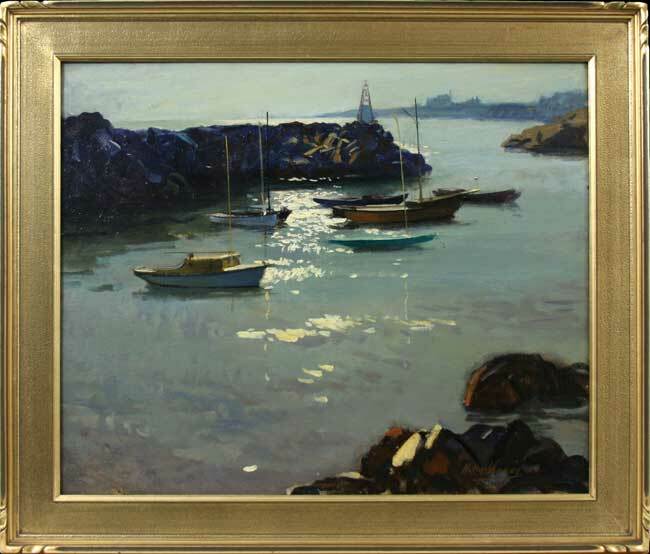 "Daily Life In Rockport," 8 x 11. 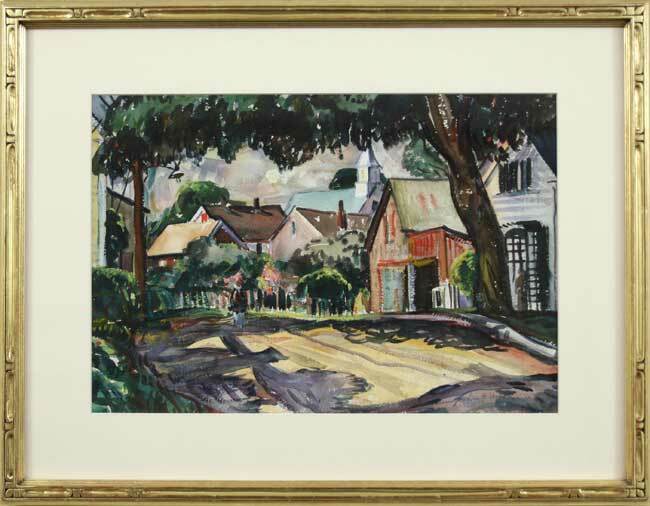 Comical house painting scene reads "This building has been, is being & will be painted from every view & by all sorts of artists...From the Wessel Family, 8/2/46." 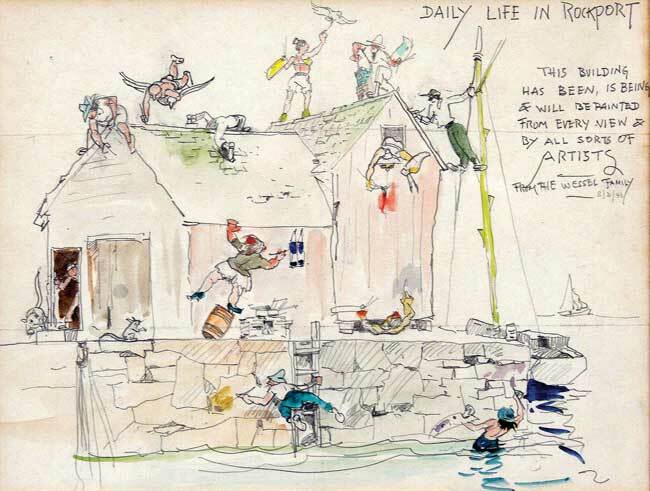 The whimsical sketch shows a building with artists of all shapes and sizes in all postures painting the building, one is flying above working on the roof, one is painting birds flying overhead, one dangles from a pole, one stands in the ocean, all as cats and mice look on. 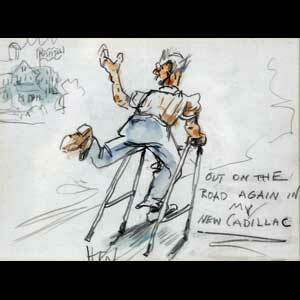 Herman Wessel, pencil sketch with watercolor. "Mr. Gull..." 8 x 10. 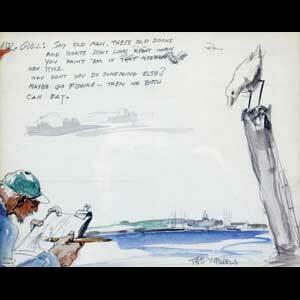 Sketch shows Wessel at work with brush in hand with a talkative sea gull perched on a post, sketch reads "Mr. Gull: Say old man, these old docks and boats don't look right when you paint 'em in that modern, new style. Why don't you do something else? 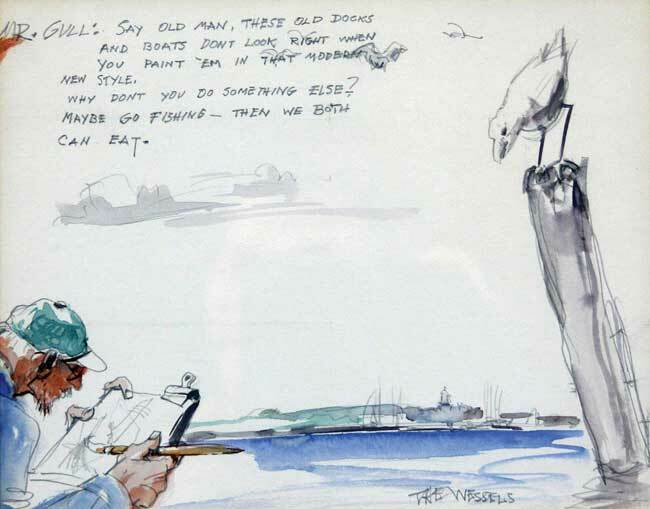 Maybe go fishing - then we both can eat"
Herman Wessel, pencil sketch with watercolor. 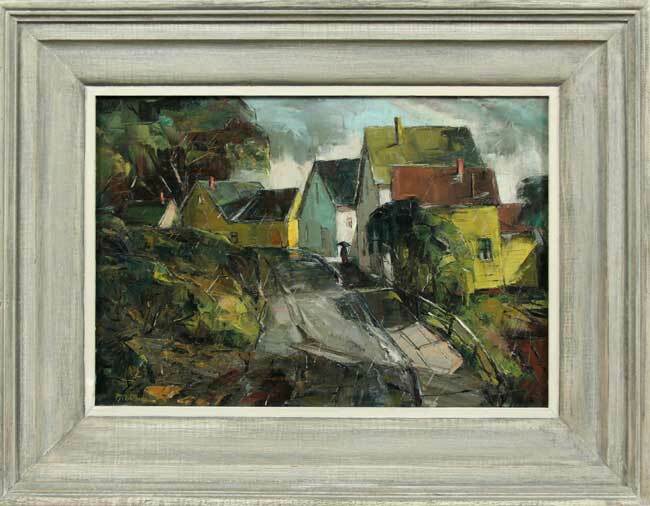 "Street Scene in Gloucester - 1961," 8 x 10.5. 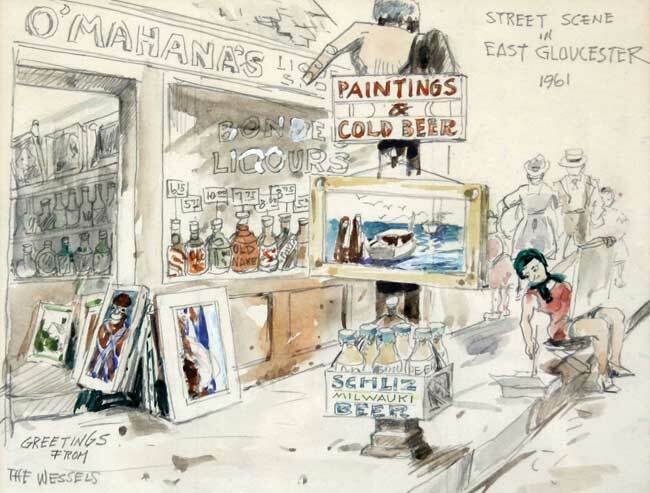 Sketch shows O'Mahana's Liquor Store with paintings stacked in the entrance, large sign in front points to the store and reads "Paintins & Cold Beer," a beer case dangles from the sign post reading "Schilz Beer, Milwauki," the sidewalk in front is filled with artists and folks strolling by, signed LL, "Greetings from the Wessels". 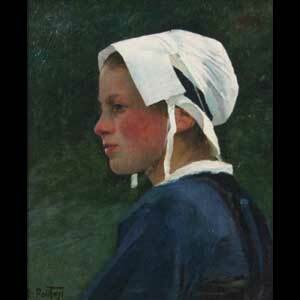 Herman Wessel, pencil sketch with watercolor. 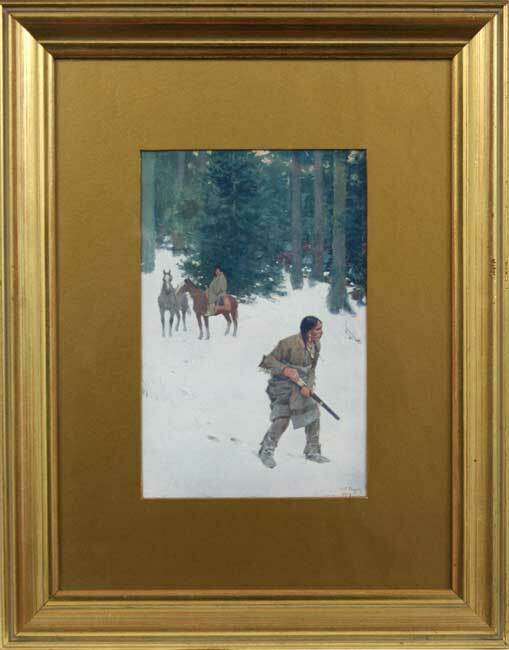 Interior scene at Wessel's Alpine Place Studio,8 x 11. 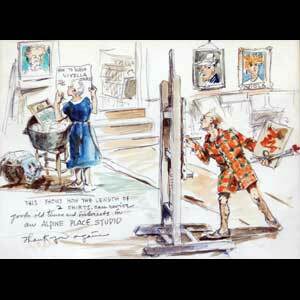 Interior scene at Wessel's Alpine Place Studio shows the artist at his easel and (perhaps) Bessie at a wash tub reading instructions on "How to wash Viyella shirts." 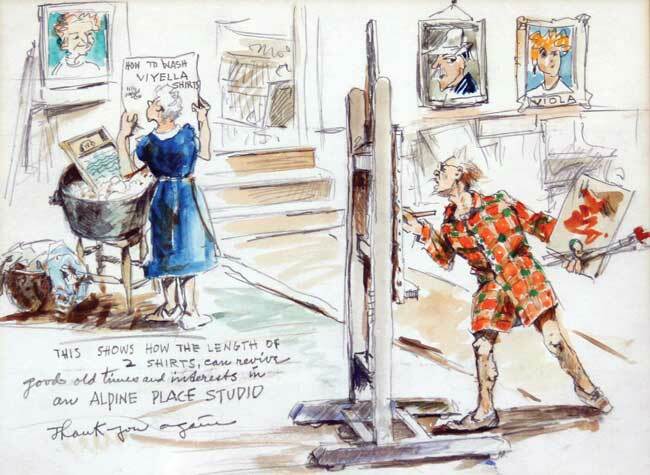 The sketch reads "This shows how the length of 2 shirts can revive good old times and interests in an Alpine Place Studio - Thank you again"
Herman Wessel, pencil sketch with watercolor. 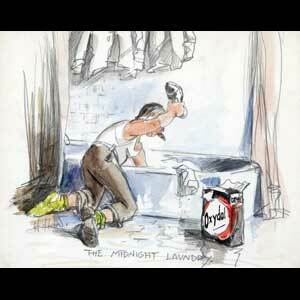 "The Midnight Laundry," 8 x 9.5. 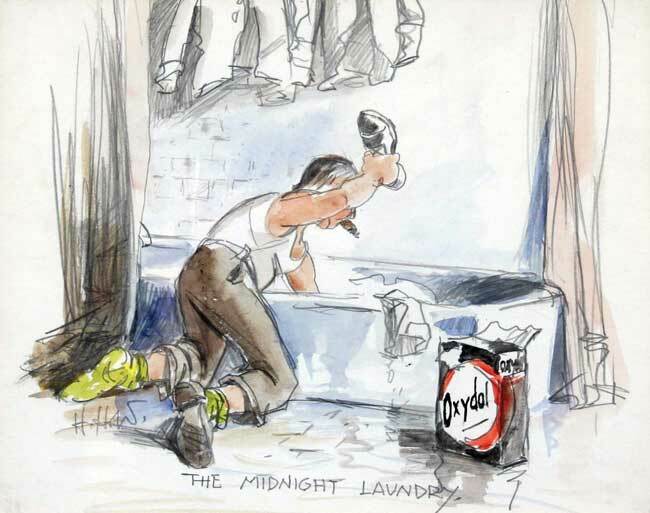 Comical scene of man with cigar and one shoe off pounding laundry in a bath tub with that shoe, an open box of "Oxydol" sits beside him, initialed LL. 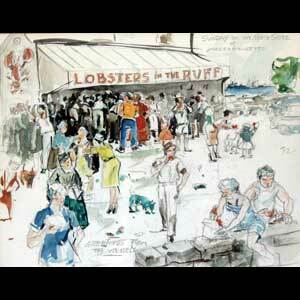 Herman Wessel, pencil sketch with watercolor. "Lobsters in the Ruff," 8.5 x 11. 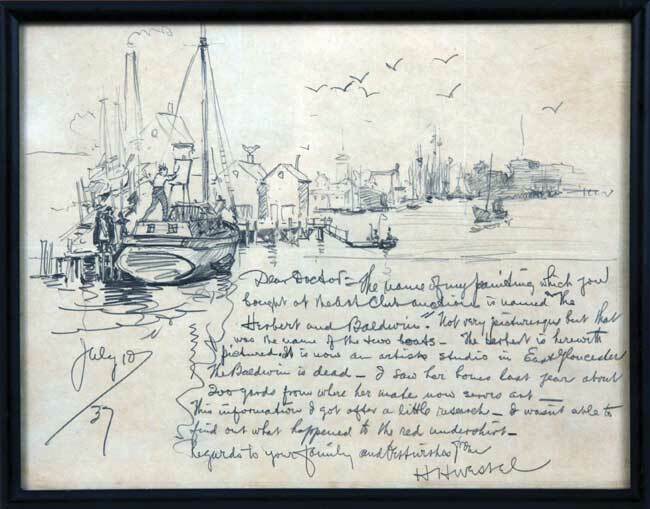 Sketch reads "Sunday on the North Shore of Massachusetts, Greetings From The Wessels." 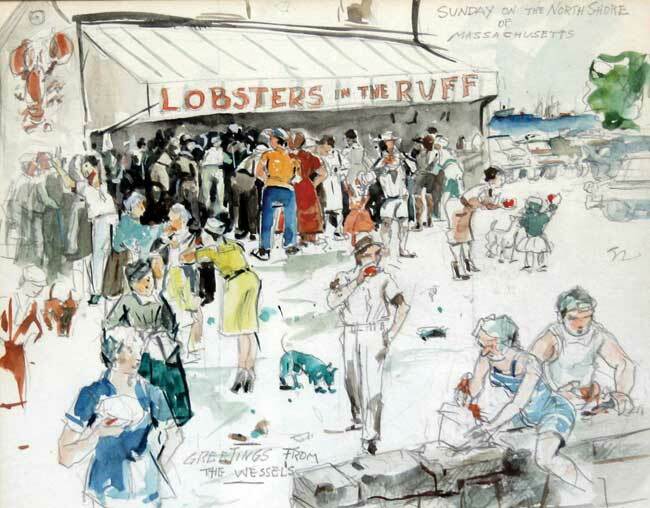 Terrific scene showing crowd of shoppers under a vendor's awning reading "Lobsters in the Ruff." 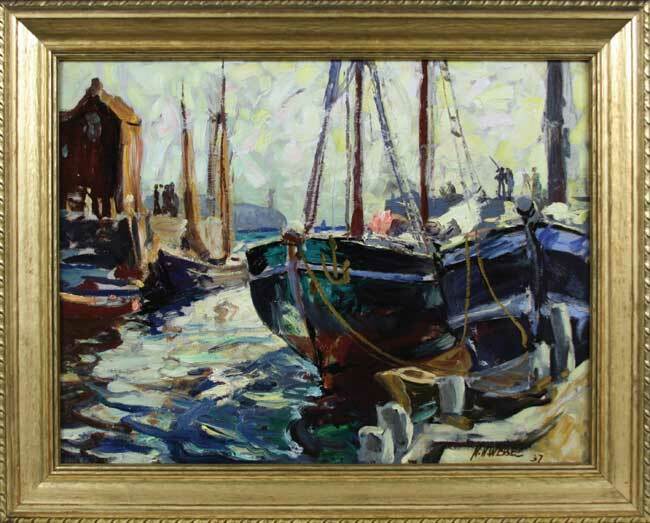 Children play in the street, folks unwrap their purchases and have lunch, dogs stroll by and a distant harbor with sailing vessels is in the background. 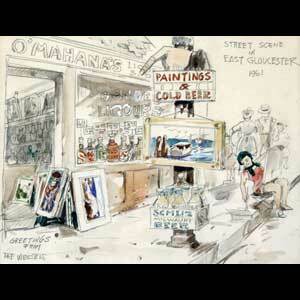 Herman Wessel, ink sketch with watercolor. Comic fishing scene, 8 x 10. 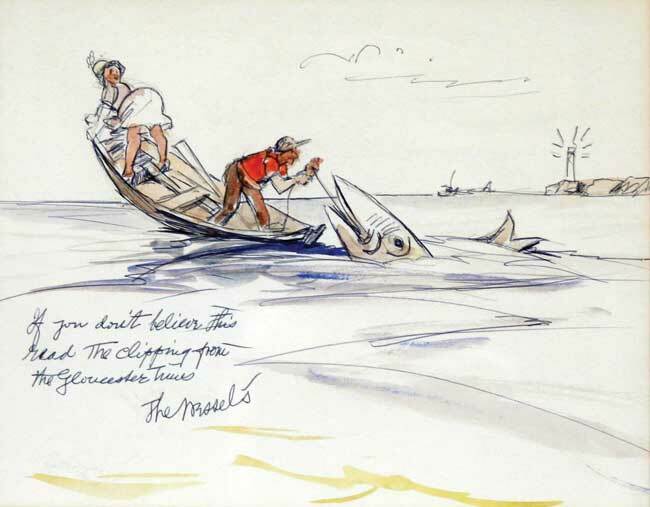 Fisherman and well-dressed robust woman in tiiny fishing boat, with fisherman attempting to remove a hook from the mouth of a giant fish, sketch reads "If you don't believe this, read the clipping from the Gloucester Times...The Wessel's". 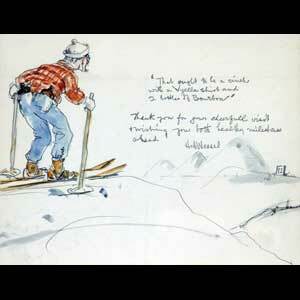 Herman Wessel, pencil sketch with watercolor. 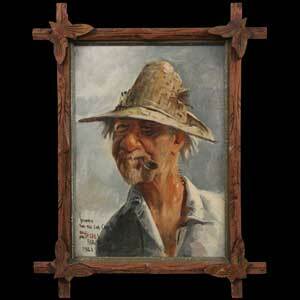 Acknowledgement of Wessel's 82nd birthday, 8 x 10. 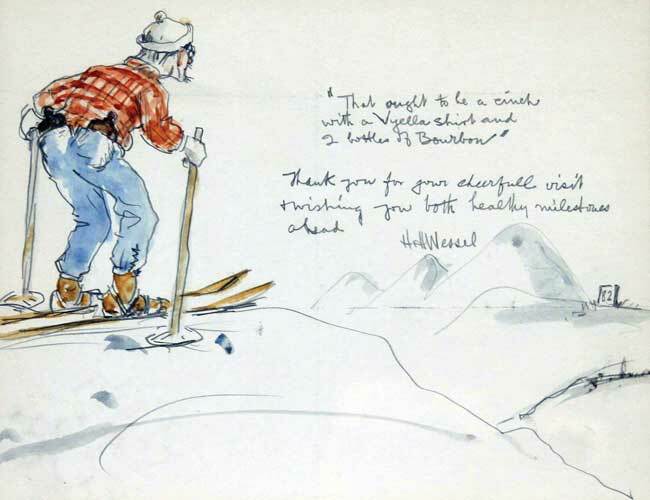 Sketch shows the artist on skis with ski poles, a red plaid shirt and two bottles of whiskey in his pants pockets, he's on a mountain top, straining to see the end of the slope, marked by a sign reading " 82." 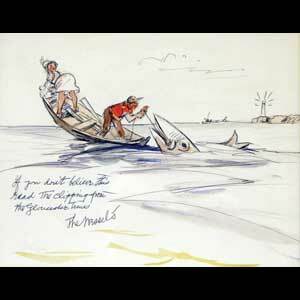 Sketch reads "That ought to be a cinch with a Vyella shirt and 2 bottles of bourbon. Thank you for your cheerful visit & wishing you both healthy milestones ahead... H.H. Wessel". Herman Wessel, ink sketch with tempera on silver paper. Cincinnati theme Christmas card, 5.5 x 7.5. 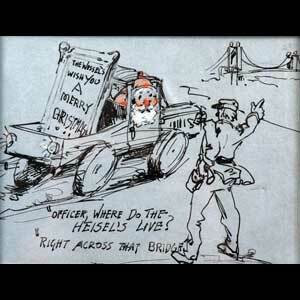 Sketch shows Santa Claus in a pickup truck hauling a framed message reading "The Wessel's Wish You A Merry Christmas." 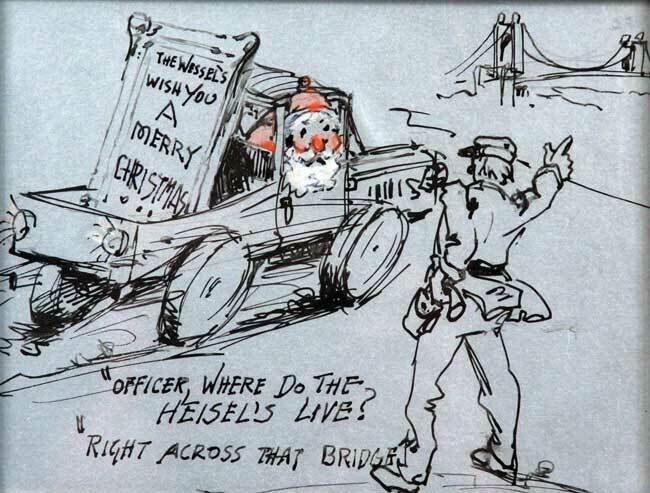 Santa asks "Officer, where do the Heisel's Live?" 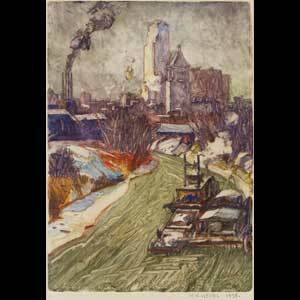 A uniformed policeman points to the Roebling suspension bridge in the distance and reples "Right across that bridge". 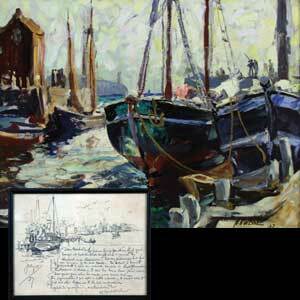 Herman Wessel, pencil sketch with watercolor. "Out on the road again in my new Cadillac" 5.5 x 7.5. 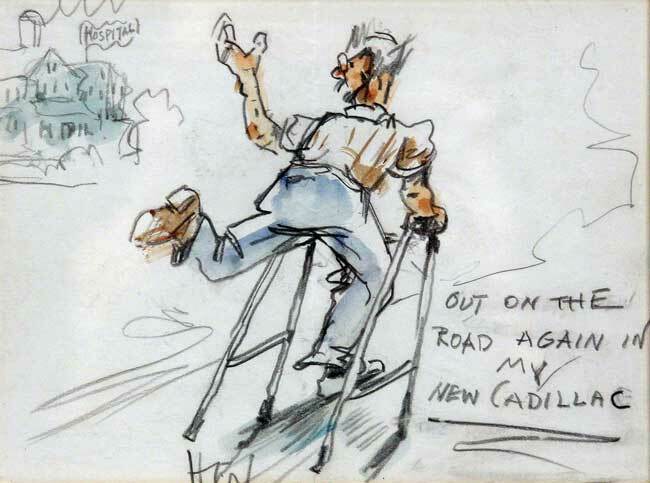 Sketch shows Wessel gliding along with a walker implying the mobility of a pair of skis. Wessel waves to a distant hospital as he glides by, happy to be released. 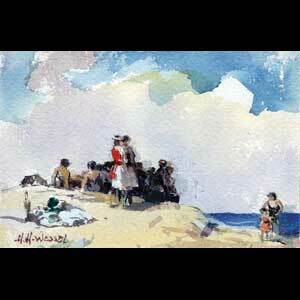 Herman Wessel, pencil sketch with watercolor. 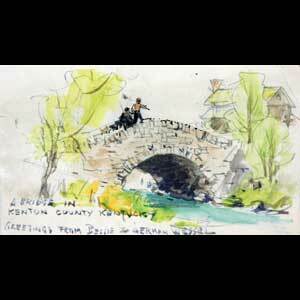 "A Bridge in Kenton County Kentucky..." 3.25 x 5.5. A postcard mailed to "Dr. & Mrs. Clifford Heisel" postmarked August 10, 1953 depicts a couple crossing a stone bridge over a stream with a large home and tall trees in the background. 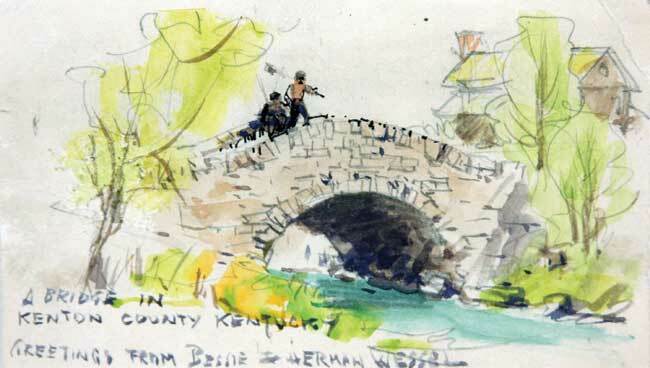 Sketch reads "A Bridge in Kenton County Kentucky - Greetings from Bessie & Herman Wessel." Herman Wessel, pencil sketch with watercolor, 8.5 x 11. A letter mailed to "Dr. & Mrs. Clifford Heisel" postmarked August 10, 1962. 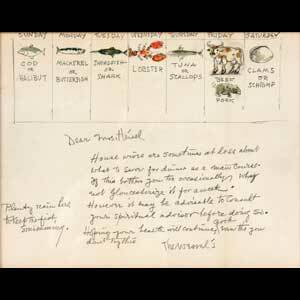 A seven-day menu with a Wessel-sketched main course suggestion for each day. 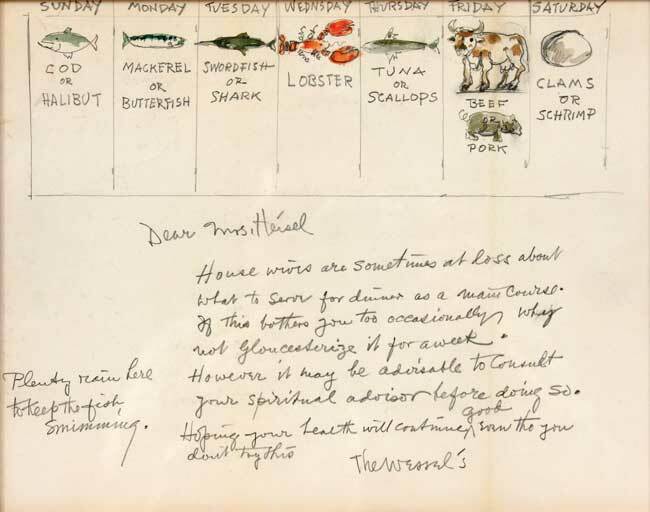 Sketch reads "Dear Mrs. Heisel, Housewives are sometimes at a loss about what to serve for dinner as a main course. If this bothers you too, occasionally why not "Gloustersize" it for a week? However it may be advisable to consult your spiritual advisor before doing so. Hoping your health will continue good even tho you don't try this. Plenty rain here to keep the fish swimming. The Wessel's"